Charging the Earth - Solar! : NiCad Battery is charged and working! 4 December 2012: NiCad Battery is charged and working! The Battery pack has been charging all night and three of the four lights on the car charger are on, indicating that the battery is 75% full. I've taken advice on this and it seems that the car charger will never show FULL because NiCads behave differently from lead-acid. The car charger shows an LED light for 25%, 50% and 75% and 100% full. The lead-acid car battery would float up to just over 12 volts when it was full and that would tell the smart charger to stop charging (or go onto trickle only). With my rows of ten 1.2 volt units, these rows rise to just under or exactly 12 volts, so the car-charger doesnt think it is full and keeps pushing. I shall have to learn to charge only up to the 75% light in future. Dedicated NiCAD chargers for things like torch batteries or my cordless drill are designed for the job and know what to go up to. One solution would be to reconfigure the battery with the cells arranged in lines of eleven, i.e. 13.2 volts per line. The other thing is to leave it as it is, and watch how it performs. The wooden box they are in is perfect for lines of 10, very difficult for lines of 11. The PV panel will be connected eventually, and that is unlikely to overcharge it, with a 160 amp-hour capacity. 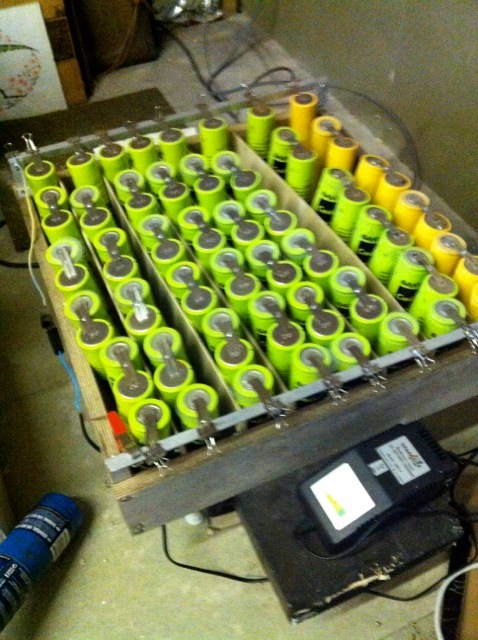 The battery pack is now disconnected from the charger, and is running all the electrical systems in the loft, including energy meter and pumps. I shall keep an eye on it and check voltage daily. I will run an extension lead down into the house with a very clearly labelled socket, and put some items in the house onto the battery. 7 Dec Post Post script: Sometimes one has to recognise when an idea is not so good. Methinks I should have used a Lead Acid battery, at lease it would behave in a predictable way with a conventional car charger. I will persist with this a little longer. I shall not install the PV roof panel, or at least if I do it will be without the benefit of scaffolding, and may be done in the summer. The scaffolding charges would have been enough to pay for the lead-acid battery by now.